When you think about warehouse security, what images come to mind? Most people think high-tech security cameras and roaming security guards. Although these are both methods to help keep watch over a warehouse, they’re not the only options warehouse managers or company owners have. Commercial locksmith services in Hamilton range from door locks to motion-sensor cameras. If you want to secure your warehouse, you need to make sure all access points are secured and locked. In this post, we share some warehouse security tips. At a warehouse, there are some basic lock characteristics that need to be understood to better secure the facility. 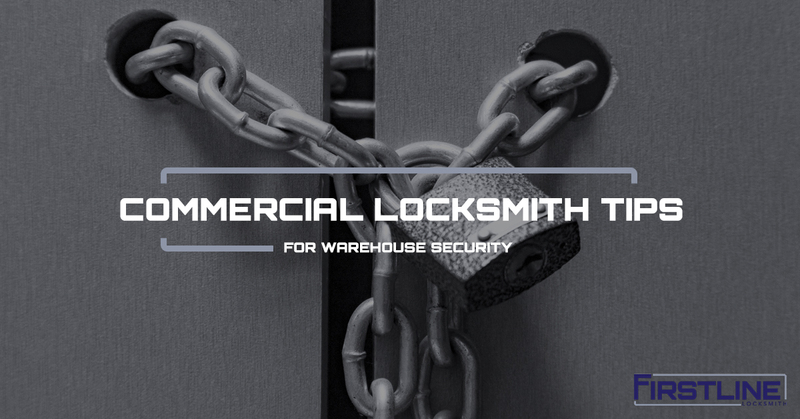 Other parts of your warehouse lock should equally strong metal as the part listed above, but they’re not as important in keeping criminals out. Take note that if you purchase your own commercial door locks from a hardware store, check what the metal content. You do not want to use locks that utilize brass or plastic. These are weak materials. A lock with greater internal mechanism complexity will be harder to silently break into. Lockpicking is still a threat to warehouses, and they need to understand that criminals are intelligent. They will work to find a way into your warehouse, if what’s inside is valuable enough to them. This is why a more complex cylinder helps deter most lockpicking attempts. It’s easy to buy your own commercial door locks, stamp each key with “DO NOT COPY,” and hand out the keys to the appropriate employees. However, the stamp won’t stop most hardware stores from copying a key. If you or an employee loses a key, you’re at risk for break-ins. A solution to this is to create your own patented key to go with custom commercial door locks. You can find brand name locks that include a patented key, which cannot be copied due to its shape or size. With this in mind, a custom lock and key are not foolproof, but it will deter a large majority of criminals. A commercial door lock that utilizes a patented key is much harder to get copies of keys and break into. A warehouse has many entry points. You have a front access gate. You have external doors and bays. You also have internal doors. At each “point of entry,” there should be a lock mechanism of some kind. For access gates, you can use padlocks. For exterior doors, you can use handles and deadbolts. For interior doors, consider using handles and deadbolts. You want to find the right types of locks for all entry points for your warehouse. On a more conceptual level, you need to consider what type of security threats your warehouse may face. Ask yourself, “who has access to the warehouse on a regular basis?” and “what can I do ensure all security threats are addressed with my warehouse security system?” Some common security threats are employee theft, external theft, and natural disasters. Yes, your employees may attempt to steal from you. In fact, they may be doing it right now, and you just don’t know it yet. Also, criminals that do not work for you may be looking for an opportunity to get inside your warehouse and take what they want. Finally, a natural disaster can leave your property and products vulnerable. Firstline has been working with businesses for more than 25 years, providing them commercial locksmith services in Hamilton and the greater New Jersey area. Need to asses and secure your warehouse? Give us a call today! Otherwise, use the tips in this post to better secure your warehouse and deter criminals from taking advantage of your security flaws.